The name of Michael Cooney, a piper raised in Westmeath and Tipperary, is fairly familiar to Americans because of his touring the US some years ago with Galway accordionist Joe Burke and performing with him at the famous John D. McGurk's in St. Louis. The two, along with singer/guitarist Terry Corcoran, recorded a CD for Green Linnet in 1986, and Cooney has appeared on a few other self-produced recordings since, but this is his first full-scale solo recording. He is joined by Kevin Burke (fiddle), playing in particular Burke's own jig "The Split Rock," with accompaniments by Ged Foley (guitar), Bernie Nau (keyboards), and Tim Hogan (bodhran). 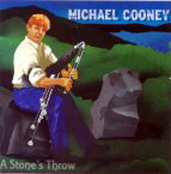 Cooney has a solid technique and has overcome the upper-octave intonation problems which made the Green Linnet CD hard to listen to for me. He combines classics of the piping tradition, like "The Gold Ring" and "Sean Reid's," with other tunes from further afield, like Kieran Hanrahan's "The Gold Stud," Frankie Gavin's "The Doberman's Wallet," even the famous Thomasson waltz "Midnight on the Water." One track of reels is played on a Froment flat set (B). On the slower side, there's a lovely rendition of the air "Greenfields of Canada," with flawless F naturals, and an interesting doubling on slide guitar the second time through, as well a nice arrangement of "Sally Gardens" for two low whistles.